As a fan of horror, science fiction, and fantasy films, I realize that accepting a certain amount of pseudo-science, illogical human behavior, and flat-out nonsense in general goes with the territory. All I ask is that a film have some idea of what its tone is and a decent understanding of its own internal logic and rules. The more serious in tone and rooted in the real world a film tries to be, the more I'm going to hold it to those standards. That's why a film like THE HAUNTING (1963), which presents itself as a film that takes both its paranormal subject matter and human psychology fairly seriously, is held to a much higher standard than your average dead teenager movie. It might seem unfair, but for what it's worth THE HAUNTING passes with flying colors, while just about every FRIDAY THE 13TH film after the first two land somewhere between a C minus and an F on my scale, despite having the bar set much lower. Like THE HAUNTING, Andres Muschietti's MAMA wants to be taken as a serious look at the supernatural. It may not utilize the same sort of scientific trappings as the other film, but it makes a good effort to present its characters as real, intelligent, and believable human beings living in the same world as the audience. This is evident right from the start, as the event which sets the story in motion – a father kills his ex-wife and kidnaps their two children after losing everything in a financial crisis – is sadly the kind of thing we're used to seeing on the news. The main adult characters are Lucas (Nikolaj Coster-Waldau), an artist and "cool" Uncle to the abducted girls, and his punk rocker girlfriend Annabell (Jessica Chastain). Both of these characters are handled in a more realistic way than movies generally handle such artsy types, and one gets the impression that Muschetti and his co-writers sister Barbara Muschetti and Neil Cross (creator of the hit BBC series Luther) are actually familiar with that world. This isn't the kind of movie likely to earn its actors award nominations, even when we're talking the likes of Ms. Chastain, but for what it's worth she gives a far better performance here than she does in ZERO DARK THIRTY. As anyone who has seen the trailer for this movie knows, Lucas and Annabell wind up getting custody of the girls when they're found in a cabin in the woods. Ages one and three respectively when they were taken, Lily (Isabelle Nelisse) and Victoria (Megan Charpenter) have become almost feral in the five years since their abduction. Victoria at least had the advantage of some language skills, and as these start to come back to her and improve, she tells psychologist Dr. Dreyfuss (Daniel Cash) how she and her sister were looked after by a mysterious woman known only as “Mama”. Dreyfuss at first assumes that Mama is some kind of split personality of Victoria's, but the film makes it clear from the start that she is very real, very dangerous, and very much supernatural. All in all, not a bad starting point for a horror film that, like most films executive producer Guillermo del Toro is attached to, takes a serious but fantastical approach to the supernatural that is at times almost beautiful, and at others ugly and horrific. For about the first third to half of the film, everything cruises along pretty solidly, effectively building suspense and even surprising the audience with what happens to a major character, something thankfully not ruined by the trailer as too often happens. Then it all starts to go downhill. First, the characters all have a serious case of the stupids. Like I said earlier, if this were a dead teenager movie, no problem. But this is a film that puts on airs of being more than that, and since it presents these characters to us as being intelligent, I expect the movie to follow through. But no, every single major character at some point goes wandering around outside alone at night without telling anyone else. And while I understand that the good doctor here is supposed to be a classic example of the self absorbed researcher willing to throw everyone else under the bus in order to write the paper that will surely bring him fame, fortune, and respect from his colleagues, at a certain point he goes so far as thoughtlessly put himself in danger, something such a self absorbed individual wouldn't do. Then there's Mama herself. In early scenes, when we only catch glimpses of the malevolent spirit, she's able to deliver some fairly effective chills. As the film goes on and we're treated to longer, less obscured glimpses, the shoddiness of the CGI used to bring the spectre to life becomes distracting, at times almost laughable. And what exactly are the rules that govern this apparition? It'simplied and even more or less stated that Mama can travel between the house where the girls live with their Uncle and Annabell via ugly black holes in the wall, and that she can take the girls along with her. Why, then, does she decide to possess the body of another character (who seems to be in the movie only for this purpose) and drive to the cabin? Even if I misunderstood this aspect, wouldn't it have made more sense to possess one of the girls' legal guardians for this purpose? I know, I shouldn't think too hard about it, but the way I look at it is, if the movie can't keep me distracted from thinking about stuff like that, then it isn't doing its job. The final devastating nail in the coffin of this film is the ending. This is a climax right up their on the absurdity meter with the endings of EXORCIST II: THE HERETIC or Dario Argento's PHENOMENAE (aka CREEPERS). I'm sure the filmmakers envisioned this scene as something beautiful and poignant and horrifying all at once, but it falls far from the mark. Responses among those sitting near me in the theater ranged from mild disappointment to intense anger to full-on hysterical laughter. I was with the mild disappointment faction, but it's fair to say that no one in my immediate vicinity was happy with the way the film ended. It's certainly not a safe or commercial ending, and normally that would earn some respect from me. Here, though, it just feels ridiculous on the one hand, and kind of blah and unsatisfying on the other. Too bad, because there are aspects of the film that work. Even a better movie than this one can be undone by a bad ending, though. 2 out of 4 stars. Nicely stated on your part, Bob, but still bummed that this one doesn't sound nearly as boss as THE ORPHANAGE. 1. I'm gonna catch heck for this, but I really enjoy FRIDAY THE 13TH: A NEW BEGINNING (the one where it isn't even Jason)and, while I'm incriminating myself, JASON X, if only for nanobots and the David Cronenberg cameo. 2. I totally know what you're saying about PHENOMENAE... but PHENOMENAE! 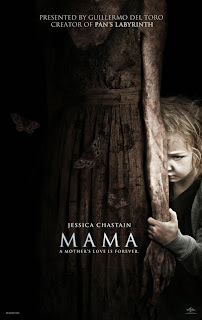 'Mama' is no 'The Orphanage', that's for sure. I think most of the F13 sequels have their moments, and I enjoy them all on at least some level. Just because they're bad doesn't mean they can be fun. I actually forgot about that scene in 'Inferno', but yeah, even in his best flicks Dario has some pretty "WTF?" moments. Meant to say, "Just because they're bad doesn't mean they CAN'T be fun." They are crap for the most part, and pretty much anything that's good about the first 2 was stolen from Mario Bava's 'Bay of Blood', but I will always have a soft spot for even the worst of the series, largely for nostalgia reasons. That said, nostalgia does not cloud my perceptions so much that I can't see the movies for what they are - cheap, unoriginal cash grabs. Of course the same could probably be said for any of the post -'Son' Universal Frankenstein movies, or any Godzilla film after the first one, but to imagine a world without 'Frankenstein Meets the Wolf Man' or 'Destroy All Monsters'... well, let's just say I wouldn't want to live in that world, nor would I want to live in a world in which Jason Voorhees corpse doesn't get struck by lighting and come back as a zombie in 'Friday the 13th Part VI: Jason Lives'. Wow, Bob Ignizio bashing pretty much the whole FRIDAY THE 13TH series has made him about as popular as Gabby Gifford at a gun show. And yes, they pretty much are crap, though the docu-feature HIS NAME WAS JASON did warm me to one of the lowliest franchises of all time. There's a scene in one sequel (I can't even remember which) when a kid actually prays for deliverance from Jason - and Jason nicely goes away. Caught me off guard, that little retro bit. Sorry I don't have anything to say about MAMA, except sounds like a wait-for-video for me. The movie was quite disappointing to me. Well crafted, but it was sort of deja vu. I'm really missing Del Toro as a director! Very much in agreement with you, Alessio. And as a long time fan of Japanese giant monster movies, I'm very much looking forward to seeing what Del Toro does with the genre with 'Pacific Rim'. We approve all legitimate comments. However, comments that include links to irrelevant commercial websites and/or websites dealing with illegal or inappropriate content will be marked as spam. All material on this blog (c) the individual authors, do not reproduce without permission. Awesome Inc. theme. Powered by Blogger.